Dosage: Recommendation for D3 and K2 supplementation.2000-5000IU of D3 (cholecalciferol) and up to 300mcg/day of vitamin K2-7 (found in Megaquinone K2-7) are popular and safe ways to go as long as you're periodically checking at least your 25-OH vitamin D levels. Take 2 cherry flavored chew tablets daily, preferably with your meals. Vitamin D and K2 work side by side to maintain control over calcium levels in the body. Vitamin D controls the absorption of calcium into the blood. Vitamin K2 controls where that calcium goes. 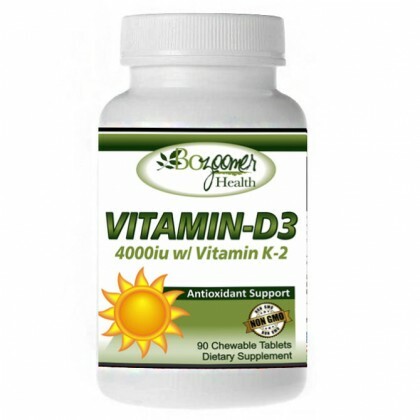 Too much vitamin D3 without adequate vitamin K2 leads to problems of excess calcium. If calcium does not distribute into the bone, it will find itself in other tissues, like your arteries. Calcium in the arteries may lead to cardiovascular disease. It contributes to atherosclerosis and vessel stiffness. You can exercise, eat a healthy diet, not smoke, and drink moderately - and still suffer from cardiovascular disease if calcium builds up in your arteries. Vitamin K is a fat-soluble vitamin that is involved in blood clotting and is important for bone health. Vitamin K2 works outside of the liver and can be safe while taking blood thinners, but you must check your PT/INR measurements with your doctor routinely. Since "active" 1,25 OH vitamin D-3 increases calcium in the blood, a HIGH level of the 1,25 OH vitamin D-3 marker is a general sign that the body is still looking for more calcium or calcium is not finding its way to where it needs to be. Higher levels of 1,25 OH vitamin D-3 means that there is more calcium in the blood needing direction - which can signal a higher need for vitamin K2 to direct things properly. Remember, active 1,25 OH vitamin D-3 can remain in the system for ~24 hours after release. So, you'll want to make sure that K2 is available for 24 hours too. Benefits of Vitamin K2 may include improved brain health, energy production, oxidative stress & metabolism, and may help with the risk of cardiovascular disease, kidney stones, and cancer development. Vitamin K2 activates certain proteins that control calcium homeostasis in the body. This includes delivering calcium into bone and keeping calcium out of soft tissues like the arteries & kidneys. Once calcium is absorbed or released in the blood, it still needs direction as to where to go! That is why vitamin K2 is crucial to healthy calcium balance in the body. Vitamin K2 is may be a leading anti-aging vitamin. Atherosclerosis and vessel stiffness or stiffness of the arteries are made worse by excess calcium. Cardiovascular disease, characterized by atherosclerosis and vessel stiffness, is the number one cause of death. Vitamin D3 is the only vitamin the body can manufacture from sunlight (UVB). Yet, with today’s indoor living and the extensive use of sunscreens due to concern about skin cancer, we are now a society with millions of individuals deficient in life-sustaining bone building and immune modulating 1,25-dihydroxy Vitamin D3. Your body must convert D-3 into a more active form, and vitamin D3 is converted 500 percent faster than vitamin D2.Vitamin D-3 is actually a neuroregulatory steroidal hormone that influences nearly 3,000 different genes in your body. For more than a century, scientists have recognized that Vitamin D3 is involved in bone health. Research has continued to accumulate, documenting Calcitriol’s (is the hormonally active form of vitamin D) role in the reduction of the risk of fractures to a significant degree. The latest research, however, shows that 1,25-dihyroxy Vitamin D3 deficiency is linked to a surprising number of other health conditions such as depression, back pain, cancer, both insulin resistance and pre-eclampsia during pregnancy, impaired immunity, macular degeneration, bone health. As it becomes clear that Vitamin D3 plays a wide role in overall health, it’s becoming equally clear that a large percentage of individuals are deficient in this important nutrient, which has hormone-like activity. The fear of skin cancer has stopped many individuals from obtaining beneficial amounts of sunlight. The skin uses the energy of UVB to convert 7-dehydrocholesterol into Vitamin D3. Even individuals, who venture out into the sun often and use suntan lotion, may be deficient in Vitamin D3. Furthermore, as we age, we are less equipped to produce sufficient quantities of this vital nutrient. One study found that age-related declines in kidney function may require older people to ingest more Vitamin D3 to maintain the same blood levels as younger people. The Recommended Daily Intake (RDI) of Vitamin D3 is set so low those mature individuals who consume this small amount (400 to 600 International Unites (I.U.’s)) are still likely to be deficient if they live north of the Tropic of Cancer or south of the Tropic of Capricorn. In fact, researchers have discovered that the RDI, which was considered adequate to prevent osteomalacia (a painful bone disease) or rickets, is not high enough to protect against the majority of diseases linked to 1,25-dihyroxy Vitamin D3 deficiency. For example, an analysis of the medical literature found that at least 1,000 to 2,000 IU of Vitamin D3 per day is necessary to reduce the risk of colorectal cancer and that lower doses of Vitamin D3 did not have the same protective effect. Researchers, led by Dr. Amie L. Peterson from the Oregon Health and Sciences University, conducted a cross-sectional analysis of 286 patients with Parkinson's disease. They found that higher 25-hydroxyvitamin D (vitamin D3) blood levels were associated with less severe symptoms of Parkinson's, better cognition, and less depression in all the patients studied. Adding to this, patients who didn't suffer from dementia had the highest vitamin D3 blood levels. Dr. Peterson explained that nearly 30 percent of patients suffering from Parkinson's disease also suffer from cognitive impairment and dementia. However, a study conducted in 2012, published in The Journals of Gerontology, found that women with a low vitamin D intake were more likely to encounter cognitive decline. This adds to the evidence of another study, which had similar results and found that women who developed Alzheimer's disease (a severe form of dementia) had lower vitamin D levels than those who did not develop the illness. One of the challenges is the outdated acceptable upper limit for Vitamin D3 consumption, which was set at 2,000 IU. However, researchers point out that more recent studies have shown that 8,000 to 10,000 IU is the safe upper limit. A growing number of researchers who have widely studied Vitamin D3 are almost begging the general public to consume more of this important nutrient. Due to Vitamin D3’s high safety profile in doses up to 10,000 IU per day and because of the wide role it plays in our health, consuming 2,000 to 5,000 IU per day of this nutrient at times of the year when sunlight is scarce is a prudent way to improve overall health.